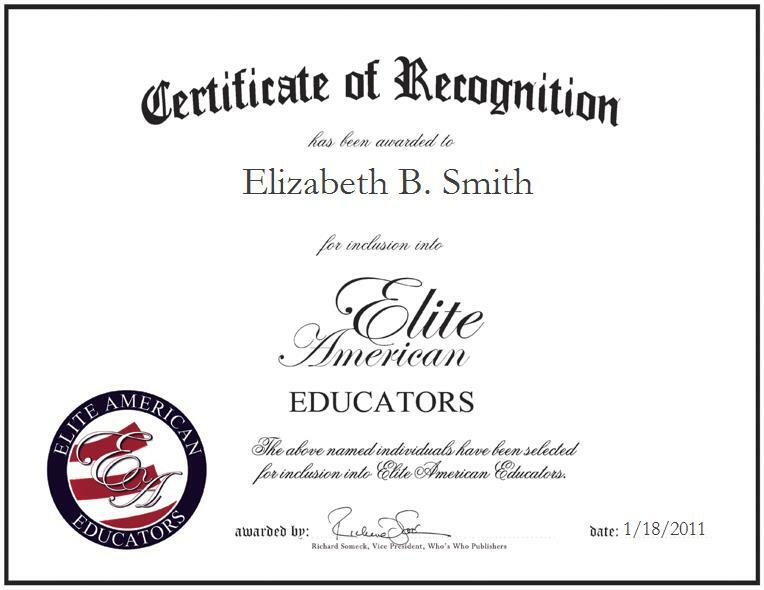 Fredricksburg, Pennsylvania, January 18, 2011, Elizabeth Smith, Computer Instructor, Webmaster and Classrooms for the Future Coach for Northern Lebanon High School, has been recognized by Elite American Educators for demonstrating dedication, achievements, and leadership in computer science. Ms. Smith has devoted her 32-year-long professional career to teaching computer programming courses in the areas of applications, Web design, desktop publishing and robotics. For the last 26 years, she has worked for Northern Lebanon High School, where she is responsible for integrating technology into the classroom, and mentoring teachers as they adapt to and utilize the new tools. Certified in instructional technology, Ms. Smith also designs websites for the school and various community programs. Infusing her kindness into every student and teacher with whom she interacts, Ms. Smith believes anyone wanting to be a successful educator must make the students their number one priority. To coincide with her passion, Ms. Smith earned a master’s degree in elementary education from Millersville University, where she also gathered 45 postgraduate credits. Previously, she attended the Lebanon Valley College and completed a Bachelor of Science in elementary education. She went on to work as an adjunct instructor for Harrisburg Area Community College before settling into her current role.